One week ago we had the great pleasure to participate in HackZurich, the largest hackathon in Europe. 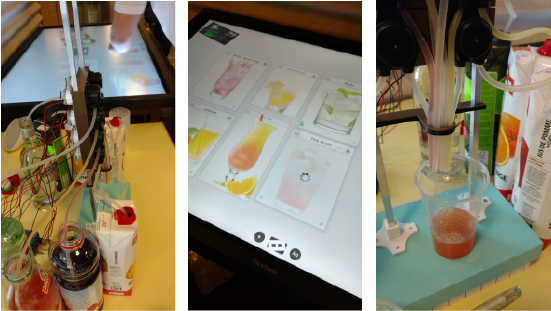 For those of you who had the chance of being among the 500 developers participating in the challenge, you might have stumbled upon a fancy drink mixing machine at our stand which was controlled by a cocktail dizmo. Originally the idea of this machine was part of a Kickstarter campaign which was then picked up by Micha Surber, who developed it further and published his insights on his blog and made the code open source on Github. He then kindly helped us building our own cocktail-machine for HackZurich, which became a major attraction during these three days of hackathon. The Code for the Internet of Drinks Server (Arduino based) as well as the Dizmo controlling it are available on Github as well. Besides getting involved in inspiring talks with developers about our IoT-machine we experienced some properties which are still capable of development. 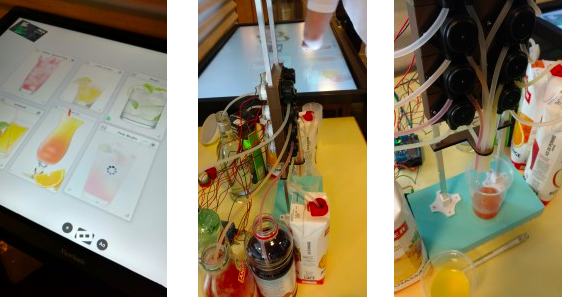 Speaking from experience, it would, for example be a great advantage if a sensor could be added to the machine which mixes drinks only, if the cup is underneath, or even the possibility of calculating and predicting when a beverage bottle becomes empty. If you have any ideas of how to enhance or tweak the drinking machine, feel free to use the source code and let us know about your progress via @dizmos on Twitter, using the hashtag #dizmonks. We look forward to hearing from you!